Everyone loves chocolate. As a kid growing up in England I remember going to the store and getting a Heath bar, which was a really special treat as we didn’t often have the money to spend it too extravagantly. Fast forward to 2013 and the Heath bar has turned into Chocolate Heroin! You’ll know why it has that name once you have a piece. And yes, the first piece is free! If I had gone into the restaurant business, this would have been a staple! 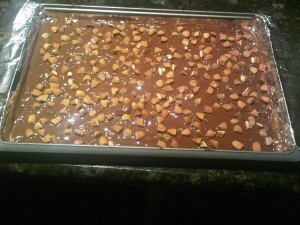 In a 350F oven, place the almonds to roast for 18 minutes. Remove from oven and allow to cool. Chop the almonds in half and leave aside. 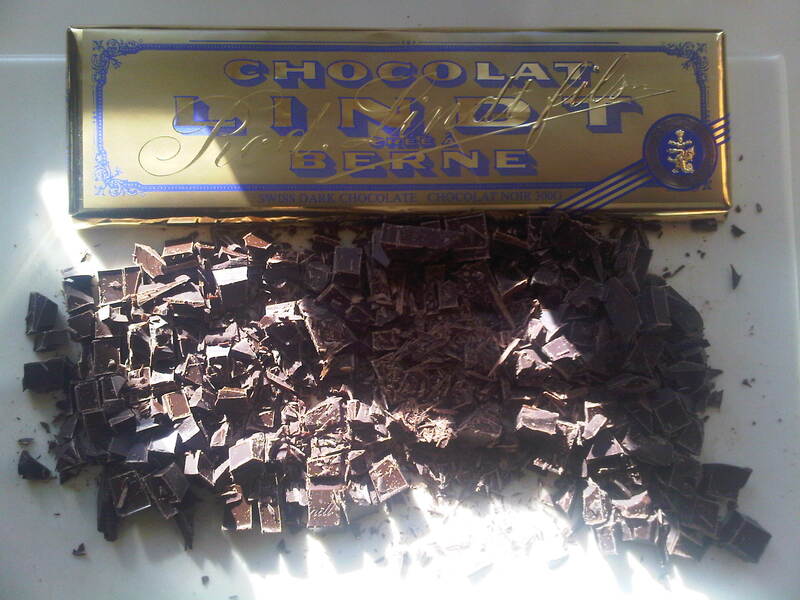 Open the Lindt bar and cut the chocolate, first vertically in fine 1/4″ strips and then horizontally in 1/2″ strips. This will make the chocolate small enough to melt quickly later. Line the baking tin with a layer of aluminum. Use one sheet only, do not overlap it with another sheet. 1. 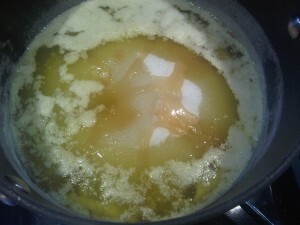 In a medium size saucepan place the butter and add medium heat until melted. 2. 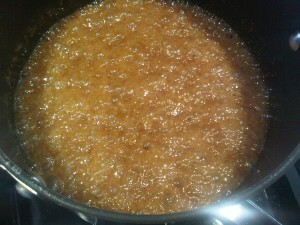 Add the sugar, syrup and water to the butter. 3. 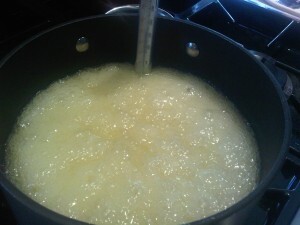 Continue stirring the mixture until the sugar is melted and the mixture becomes bubbly. 4. Clip the candy thermometer to the saucepan. Be sure the thermometer is suspended in the mixture and not touching the bottom. 5. Cook the mixture until the thermometer reads 290F. This may take about 20 minutes. Once the mixture hits 260F, you should watch it closely. 6. 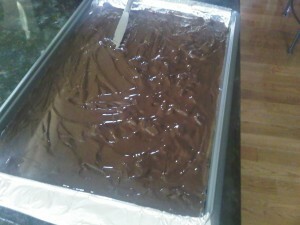 Pour the mixture into the baking tin on a heat proof surface. The mixture will settle on its own, there is no need to adjust it. 7. After 5 minutes, sprinkle the chocolate on the top of the caramel. 8. After 5 minutes, using a knife, spread the chocolate evenly over the top of the caramel. 9. After 2 minutes, sprinkle the almonds over the mixture. 10. Let cool overnight, break into pieces and enjoy!